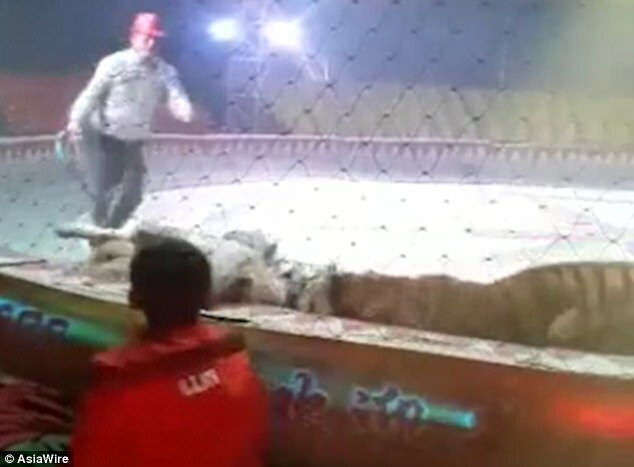 This is the shocking moment a circus horse is being bitten by a tiger and a lion during rehearsal in northern China. 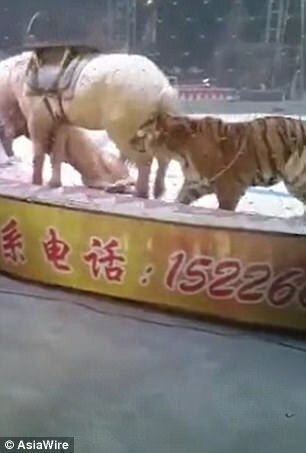 Footage shows a tiger pounces on a white horse's back while a lion is biting the horse's legs as workers whipping the two wild animals in attempt to free the horse. It's said the horse survived and sustained minor injuries. 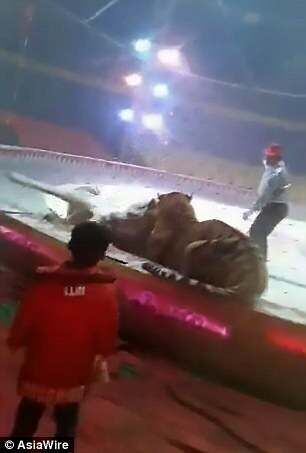 Mr Xu, a staff member from Taiyang Circus told btime.com that the crew were practising a show that a tiger and a lion riding a horse with a saddle on. The incident was claimed to be happened about a month ago, around end of December and beginning of January in Cangzhou, Hebei Province. 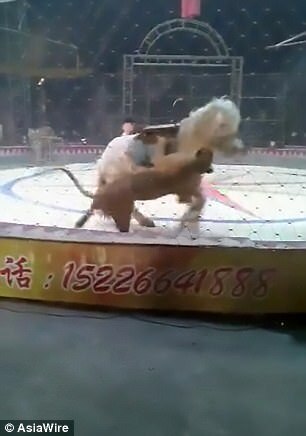 Mobile phone footage shows the white horse running along the circus in the cage, whilst having a lion gnawing from bottom. A tiger can also be seen chasing close behind and ready to attack. 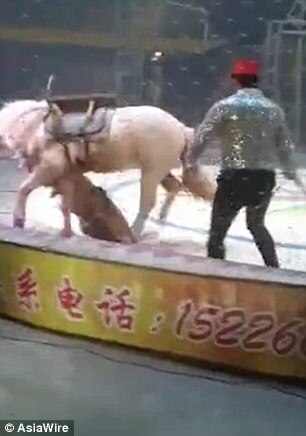 Around four circus workers used whiplash and long poles to hit and beat the big cats until the horse was set free. Mr Xu said he was not worried the staff member being attacked as the circus kept the lion and the tiger at young age. He is confident that there will have no danger to walk close to the animals. It's claimed that the white horse survived and sustained minor injuries. Web users commented on Weibo, a Chinese social media site, and requested the government to look into animal cruelty problems. 'Shut down the circus! This is too cruel to both wildlife and domestic animals!' said 'joyemiao'. 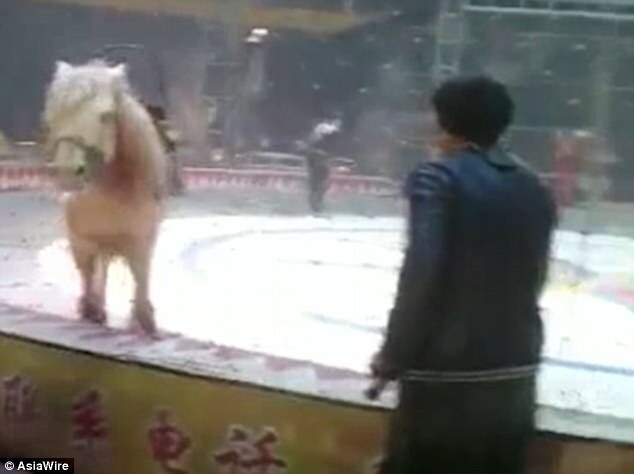 'WangxingWX' said circus animals had a lot of pressure to take on and the workers 'were lucky to have it avoied'. Keith Guo, PETA Asia press officer for China told MailOnline that 'it's only a matter of time before captive animals lash out at their oppressor'. 'Big cats in the circus suffer mentally and physically every single day. When they are not performing, they are confined in cramped, filthy cages and whips and beatings are used to force them to perform,' he said.